The annual Hajj pilgrimage in Saudi Arabia has reached its climax with 1.5 million Muslims gathering at Mount Arafat to offer day-long prayers and recitations from the Koran. The pilgrims congregated from sunrise at the site and the vast plain which surrounds it, about 15km from Mecca. Muslims believe the Prophet Muhammad gave his last sermon at the location. The Hajj is one of the five pillars of Islam, which all Muslims are called upon to perform at least once. On Saturday it emerged that Saudi Arabia's top cleric, Abdul Aziz al-Sheikh, would not deliver the traditional Hajj sermon for the first time in 35 years because of health complications. It follows controversy sparked by his remarks that Iranians were "not Muslims". 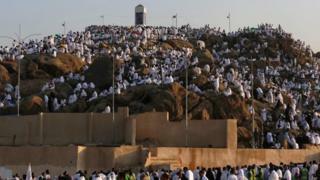 The comments came after Iran's supreme leader Ayatollah Ali Khamenei denounced Saudi Arabia's management of the Hajj. Iran has boycotted this year's pilgrimage., instead endorsing an alternative event on Saturday at the holy city of Karbala in Iraq. Tensions between the two countries have risen after a crush in last year's pilgrimage killed at least 2,426 people, including 464 Iranians, according to an unofficial count. Saudi Arabia and Iran do not have diplomatic relations and are at loggerheads over a series of regional issues including the conflicts in Yemen and Syria. But news of the Ayatollah's absence has not diminished the enthusiasm of the pilgrims. "It's marvellous," Egyptian pilgrim Louza, 45, was quoted as saying. "I'm here closer to God. It's an indescribable feeling." Against a backdrop of other mountains the pilgrims squatted, stood, or climbed up steps constructed into the hill while reciting incantations. "We feel at ease and are totally benefiting from our pilgrimage," Soumaya, 30, from Mali, told the AFP news agency. Her friend, Khadija Bechir, 23. agreed, praising the event for being well organised. Pilgrims come from all over the world to the Hajj but Indonesia - the most populous Muslim nation - has the largest quota. Official figures issued late on Saturday revealed that more than 1.3 million pilgrims attending the Hajj are from outside Saudi Arabia. A vast expanse of white fireproof tents has been pitched at Mina, to accommodate in excess of 2.5 million pilgrims. The stampede in Mina last September is considered to be the worst disaster in Hajj history. It took place as pilgrims were going to the Jamarat Bridge for a stoning ritual which this this year will start on Monday, officials say. Saudi Arabia has consistently downplayed the number of casualties. It has announced an investigation but no conclusions have been released.